Demolitions can be a thrilling part of any construction process. But there are some things you should know about what’s involved in a demolition. So, in this week’s blog, we share five things everyone needs to know before starting a demolition. The first and most important thing before considering a demolition is that you seek the professionals. Although it may seem like a cheap and easy thing to do yourself, it is essential that an experienced crew performs the demolition to create the best outcome, as well as to prevent any injuries. Demolitions are generally loud and messy. While this is something that can’t be avoidable, it’s only courteous to let your neighbours know prior to the demolition beginning so they are aware of what’s going on. Maybe even bring over a bottle of wine or sweet treat before the demolition begins to maintain a friendly relationship. During a demo, it’s not safe for you to live in your home. This is the perfect time to go on a holiday or get away for a bit. If asbestos is discovered during the demolition, this can shut down the project. 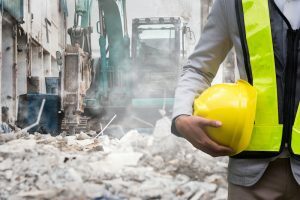 It’s crucial that you understand the significance of discovering asbestos and how dramatically this can impact your demolition. To achieve the best results and particularly, if you’re undertaking a significant remodel, we recommend stripping down all the walls to the studs. There can be lots of stuff hidden between the walls from when someone tried to perform a remodel years ago. At Alpha Environmental, we can provide you with a Hazardous Materials Audit, which identifies the hazardous materials prior to the refurbishment or demolition of a building. This is an essential step that must be taken before beginning a demolition. To learn more or to receive a site specific, obligation free quote, please call us today on 1300 039 181.